Some months ago, just after I got an 8-core CPU, I wasted a weekend trying to get SciPy/NumPy to build against OpenBLAS. OpenBLAS is neat, as it has built-in and automatic support for multi-threading, for things like computing the dot-matrix of large matrices this can really be a time saver. I was using roughly these instructions, but it was too complicated and I got nowhere and gave up. 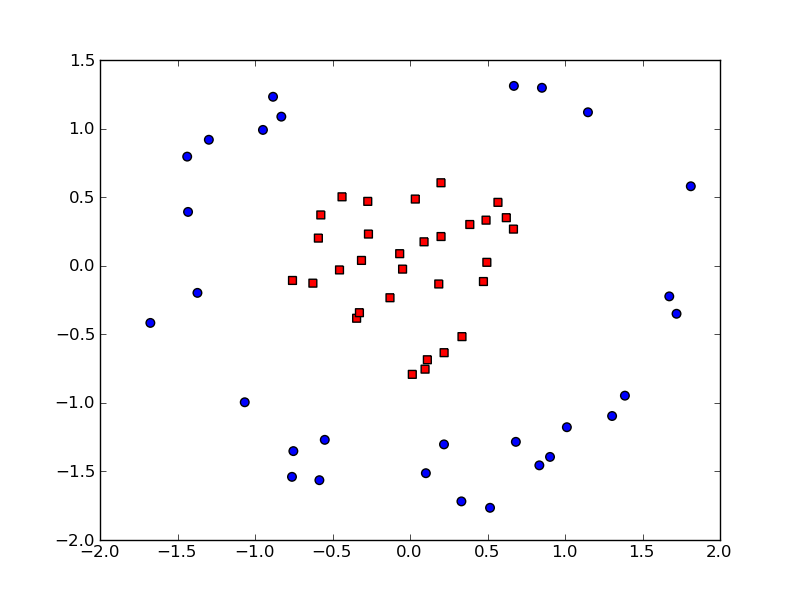 Using these scripts you can test your NumPy and SciPy installation. Be activating/deactivating the virtualenv, you can test with/without OpenBLAS. If you have several CPU cores, you can see that with OpenBLAS up to 4 CPUs should also be used. I got a new shiny MacBook in my new job at Bakken & Baeck, and figured it was time for a new start, so I am de-commissioning my old MacBook and with it, the profile and files that are so old it used to be on a PowerBook. Most things were easy, until I got to the photos. Over the years I have imported photos to the laptop while travelling, but always tried to import them again to my real backed-up photo archive at home when I got there, unless my SD card was full while travelling, or I forgot, or something else went wrong. That means I am fairly sure MOST of the photos on the laptop are also in my archive, but also fairly sure some are not. And of course, each photo, be it an out-of-focus, under-exposed test-shot, is a little piece of personal memory, a beautiful little diamond of DATA, and must at all cost NOT BE LOST. The photos are mostly in iPhoto (but not all), in a mix of old-style mixed up in iPhotos own folder structures, and in folders I have named. I can copy all JPGs from the Pictures folder into one big folder without overwriting files with duplicate names (I ❤ coreutils? ), then let Picasa sort it out for me. So, next step, compute the md5sum of all 7500 new photos, and of all 45,000 already archived photos. Write the shell-script, go to work, return, write the python to find all duplicates, delete the ones from the laptop. Success! 3700 duplicates gone! But wait! There are still many photos I know for a fact are duplicates, I pick one at random and inspect it. It IS the same photo, but one JPG is 3008×2008 and the other is 3040×2024, also the white-balance is very slightly different. Now I understand, back when I had more time, I shot exclusively in RAW, these are two JPG produced from the same RAW file, one by iPhoto, one by UFRaw, the iPhoto one is slightly smaller and has worse color. Bah. Now it’s getting later, my Friday night is slipping away between my fingers, but I am damned if I give up now. Next step: EXIF data! Both files have EXIF intact, and both are (surprise!) taken at the same time. Now, I don’t want to go and look up the EXIF tag on all 45,000 archived photos just now, but I can filter by filename, if two files have the same basename (IMGP1234) AND are taken at the same time, I am willing to risk deleting one of them. it is done! Some ~3500 more duplicates removed! I am left with 202 photos that may actually be SAVED FROM ETERNAL OBLIVION! (Looking more carefully, about half is actually out-of-focus or test shots, or nonsense I probably DID copy to the archive, but then deleted) It was certainly worth spending the entire evening 3 days in a row on this! I love python, I really do, but some things are … slightly irregular. Recently I’ve had the chance to use RDFLib a fair bit at work, and I’ve fixed lots of bugs and also written a few new bits. The new bits generally started as write-once and forget things, which I then needed again and again and I kept making them more general. The end result (for now) is two scripts that let you go from this CSV file to this webapp (via this N3 file). Actually – it’ll let you go from any CSV file to a Linked Open Data webapp, the app does content-negotiation and SPARQL as well as the HTML you just saw when you clicked on the link. The dataset in this case, is a small collection of King Crimson albums – I spent a long time looking for some CSV data in the wild that had the features I wanted to show off, but failed, and copy/pasted this together from the completely broken CSV dump of the Freebase page. This tool is of course not the first or only of it’s kind – but it’s mine! You may also want to try Google Refine, which has much more powerful (and interactive!) editing possibilities than my hack. With the RDF extension, you can even export RDF directly. One benefit of this script is that it’s stream-based and could be used on very large CSV files. Although, I believe Google Refine can also export actions taken in some form of batch script, but I never tried it. With lots of shiny new RDF in my hand I wanted to make it accessible to people who do not enjoy looking at N3 in a text-editor and built the LOD application. This runs great locally – and I’ve also deployed it within Apache, but not everyone has a mod_python ready Apache at hand, so I thought it would be nice to run it inside the Google Appengine. Now, I am not really clear on the details on how the appengine works. Is this code run for every request? Or is the wsgi app persistent? When I deployed the LOD app inside apache using mod_python, it seems the app is created once, and server many requests over it’s lifetime. In any case, RDFLib has no appengine compatible persistent store (who wants to write an rdflib store on top of the appengine datastore? ), so the graph is kept in memory, perhaps it is re-parsed once for each request, perhaps not – this limits the scalability of this approach in any case. I also do not know the memory limitations of the appengine – or how efficient the rdflib in-memory store really is – but I assume there is a fairly low limit on the number of triple you can server this way. Inside apache I’ve deployed it on some hundred thousand triples in a BerkleyDB store. There are several things that could be improved everywhere here – the LOD app in particular has some rough edges and bugs, but it’s being used internally in our project, so we might fix some of them given time. The CSV converter really needs a way to merge two columns, not just split them. All the files you need to run this example yourself are under: http://gromgull.net/2011/08/rdflibLOD/ – let me know if you try it and if it works or breaks! Install a debian or Ubuntu based system — I used Debian testing. We use the education data because it is smaller than the research data, only 500K vs 11M, and because there is a syntax error in the corresponding file for research :). In the same folders there are files called blahblah-void. These are statistics about the datasets, and we do not need them for this (see http://vocab.deri.ie/void/ for details). Note that the two files are in different RDF formats, both contain triples, but one is serialized as XML, the other in a ascii line-based format called N-Triples.You do not have to care about this, just tell rdflib to use the right parser with the format=X parameter, RDF/XML is the default. The graph object is quite pythonic, and you can treat it like a collection of triples. Here len tells us we have loaded 3690 triples. 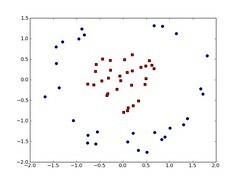 Find out what sorts of things this data describes. Things are typed by a triple with rdf:type as the predicate in RDF. rdflib gives you several handy functions that return python generators for doing simple triple based queries, here we used graph.objects, taking two parameters, the subjects and predicates to filter for, and returns a generator over all objects matching. rdflib also provides constants for the well-known RDF and RDFSchema vocabularies, we used this here to get the correct URI for the rdf:type predicate. This gives us a long list of all institutions. The set call here just iterates through the generator and removes duplicates. This gives us a list of triples asserted about UCL, here we used the triples method of rdflib, it takes a single argument, a tuple representing the triple filters. The returned triples are also tuples, the map(str,t) just makes the output prettier. The prefixes defined here at the start lets us use short names instead of full URIs in the queries. 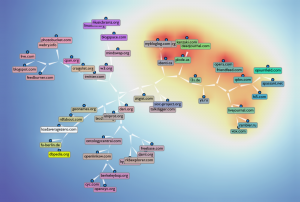 The graph.query method returns a generator over tuples of variables bindings. This lists the first 10 – this is more or less the same as we did before, list all institutions, but this time also get the human readable label. All fairly straight forward, the FILTER is there to make sure the two institutions we find are not the same. That’s it! There are many places to go from here, just keep trying things out – if you get stuck try asking questions on http://www.semanticoverflow.com/ or in the IRC chatroom at irc://irc.freenode.net:6667/swig. Have fun! 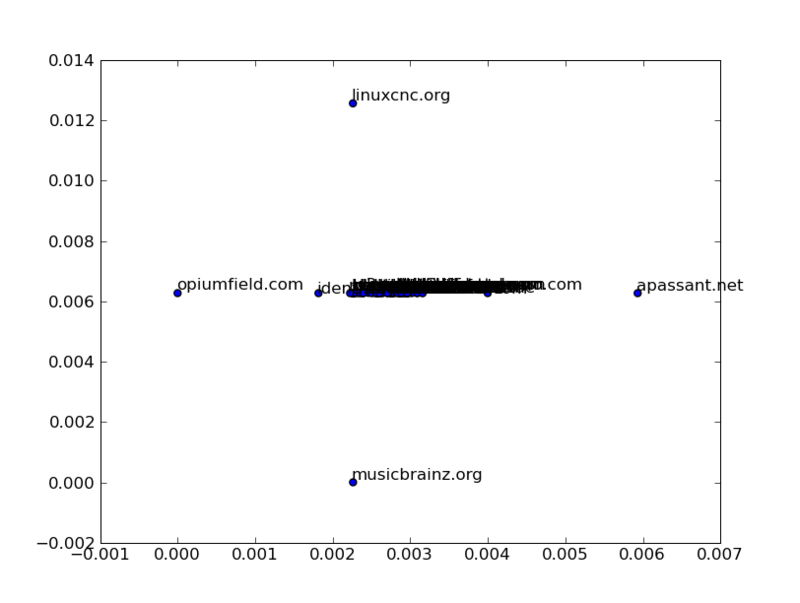 Categories: Python, RDF, Semantic Web. Take — adapt — use for anything you like, you can rotate the 3D plot in the window that is shown and you can save the figures as PDF etc. Unfortunately, the sizing of markers in the 3d plot is not yet implemented in the latest matplotlib (0.99.1.2-3), so this only looks good with the latest SVN build. 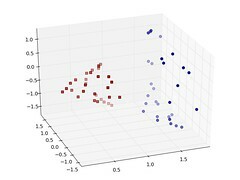 Categories: Machine Learning, Python, Visualisation. Going through the list twice makes sure I get all things that match well first (i.e. the start with the string I complete for), and then things matching less well later (they only contain the string). Where is the distance (here simple 2d euclidean), is each domain, is that domains position in the figure and is that domains feature vector. Normally it would be more natural to decrease the effect by the squared distance, but this gave less attractive results, and I ended up square-rooting it instead. The color is now simply on column of the resulting matrix normalised and mapped to a nice pylab colormap. Now this was the fun and interesting part, and it took maybe 1 hour. As predicted. NOW, getting this plotted along with the nodes from the graph turned out to be a nightmare. Neato gave me the coordinates for the nodes, but would change them slightly when rendering to PNGs. Many hours of frustration later I ended up drawing all of it again with pylab, which worked really well. I would publish the code for this, but it’s so messy it makes grown men cry. 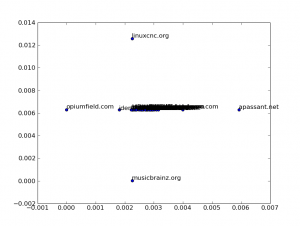 NOW I am off to analyse the result of the top-level domain interlinking on the billion triple data. The data-collection just finished running while I did this. … As he said. 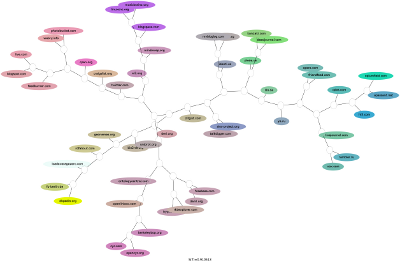 Categories: Billion Triple Challenge, Python, Semantic Web, Statistics, Visualisation. So instead of FastMap I used maketree from the complearn tools, this generates trees from a distance matrix, it generates very good results, but it is an iterative optimisation and it takes forever for large instances. Around this time I realised I wasn’t going to be able to visualise all 7500 PLDs, and cut it down to the 2000, 1000, 500, 100, 50 largest PLDs. Now this worked fine, but the result looked like a bog-standard graphviz graph, and it wasn’t very exciting (i.e not at all like this colourful thing). Now I realised that since I actually had numeric feature vectors in the first place I wasn’t restrained to using FastMap to make up coordinates, and I used PCA to map the input vector-space to a 3-dimensional space, normalised the values to [0;255] and used these as RGB values for colour. Ah – lovely pastel. I think I underestimated the time this would take by at least a factor of 20. Oh well. Time for lunch. 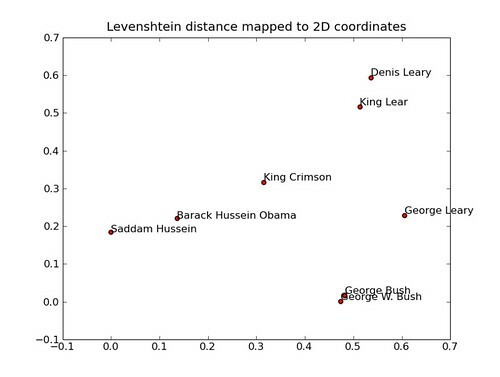 To get a feel for how it works, download the code, remove George Leary and see how it reverts to only one dimension for a sensible mapping. 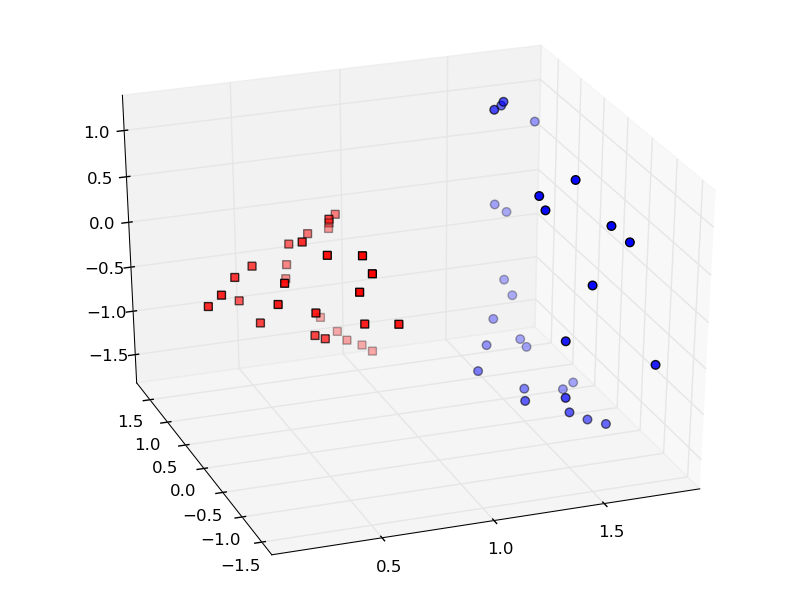 The distance measure used keeps the projection “in mind”, so the second iteration will be different to the first.The whole thing is a bit like Principal Component Analysis, but without requiring an original matrix of feature vectors. This is already quite old, from 1995, and I am sure something better exists now, but it’s a nice little thing to have in the toolbox. I wonder if it can be used to estimate numerical feature values for nominal attributes, in cases where all possible values are known? (still) nothing clever is powered by WordPress and styled by Infimum. Valid XHTML and valid CSS. Log in.